Children love animals. 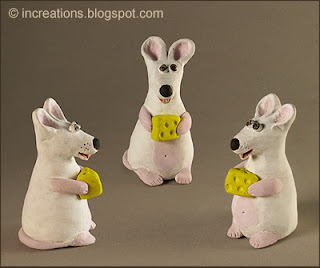 Probably the easiest animal craft to make is using a modeling material. This can be a paper pulp papier-mache, salt dough, clay, or polymer clay. No special tools are needed, a wooden toothpick or twig will be enough. Start with an animal that is easy to mold. Choose simple, clear shapes and avoid creating protruding parts. Actually, lying animals like the turtle and mouse on the photo are good to start with. 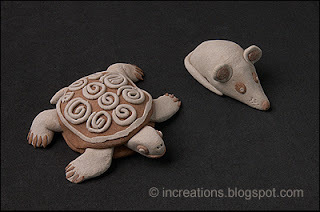 You may be using just natural colors of the material, like the earthly, ocher colors of the turtle and mouse above; or coloring the sculpture, like this cute mouse below. First, try showing the kids how you make different elements — the body, ears, paws, etc., put them together, and decorate them. Then let your little ones help you by rolling the material, or molding large parts of the sculpture. After they got the idea, let them do their own projects.